Well we have finally arrived at the weekend that my cousin Mike and his fiancé Stef get married. There is a lot of excitement in the air for the wedding. We are really looking forward to this special day. They are an amazing couple who truly compliment each other. I am blessed to have them both in my life, as well as, my kid’s lives. We love you guys and look forward to celebrating your love for each other!! Well it has begun to fall FINALLY!!! Last year at this time I think we had a few inches already. And we are all excited. Tonight we are supposed to get 8-12 inches, so we will see what happens. But, for now we are going to enjoy how beautiful it looks outside. Apparently if you really want a snow day to happen you are supposed to wear your PJs inside out. That is what the teachers say to do. So if you are hoping for that snow day as all of the kids of our neighborhood are wear those PJs inside out! Enjoy the snow! Be a kid go out and build a snowman. Make a snow angel! Do something fun with your kids in the snow! smile, open your eyes, love and go on. I have to say this fall has been a more difficult one for me than past years. The settling into a new life away from my family and friends has hit me harder. Or is it that I am just struggling over Meggan more this year. Not a day goes by that something doesn't happen that makes me reminisce about my loving sister. The kids do something that reminds me of when she and I were kids or I hear a song that she used to play so much that it drove me nuts (like ANY Journey song). I thank god that I had the relationship I had with her. I have no regrets that she may not have known how much I loved her. She knew how much her family and friends loved her that is for certain. I think that I hit every step of the grieving process when Meggan died. I truly believe I did. Angry... Denial... Sad... I did it all. But, when we come to November 9th I can't help but relive all of those steps and that night as well as the 9 days after that and the 18 years without her... All the what if's that go thru my mind. What if I stayed in that night would this have happened. What if Meggan had still been sick like the week before the accident and had to stay home. What if those kids did not have a car to use as a lethal weapon that killed 3 innocent girls... What if!!!! It is almost like when you loose your keys and you retrace your steps to find them. I go thru something similar at this time of year. I retrace my steps of those days that changed our lives forever. 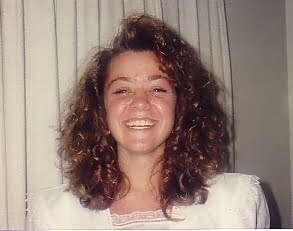 The accident (how, when what, where...) the hospital and the horrible images I will never be able to forget of my sister... Holding and comforting Meggan's friend through the tragedy and wanting to be there for them and protect them from what they were about to face... Watching my parents have to bury and grieve their child.... The funerals I attended in honor of my sister and so I could tell her when she woke up that I went for her to honor her friends, Kate and Emily... And then the realization that Meggan was never going to wake up. Oh how I wish I could take that away. But, that is the reality of this tragedy. You can't ignore it! And then there is the part of the tragedy that I struggle with more and more and that is my kids never getting to have a relationship with her. They will never have their mom's sister in their life... She is just an image and story to them. She is not real because they have never met her. They have sent her balloons, made pictures for her for the cemetery and prayed to her, but that is it. They ask frequently about meeting her, but she is just an image... I often wonder does Meg come to them in their dreams. Because there are things they talk about or do that make me wonder. One day Jack drew a picture of her and she had tears coming down her face. I asked him why is Auntie Meggan crying and he said because she wants to meet us. What do you say to that? Or Meggan went thru a period where every picture she drew had the # 17 on it. Why??? I have no idea. She did not even know that the # 17 was. Where does it come from? I can't help but wonder if she has talked to them in their dreams. This piano is an absolutely treasure to us. Something I have always wanted to have in my home. We look forward to all the playing that will happen as the years go on with the kids. Jack is excited to get to practice his piano lessons on it instead of the great keyboard we have been borrowing from the Vosters family. I am even going to pick up Piano and learn to play. I know that I will have to stock up on more Excedrin Migraine for the times that Ally will be playing the piano. But, it is all worth the smiles it has brought to the kids faces. Thank you sooo much Patti and Bob! And thanks to Mike/Brendan McDermott for helping Chad move the piano into the Uhaul and Aaron for coming over and helping Chad get the piano in the house!!! Fall is my favorite time of year. Maybe because it is when I got married or maybe because I just love seeing the trees change colors. And I love when you get to start wearing those warm sweaters on cold nights. Unfortunately the neighborhood we live in does not have any mature trees, so we don't get a ton of leaves falling. Thus, no big leave piles like when we were kids that we could run and jump in. We put in last fall a beautiful tree that gets bright red leaves in the fall. I think it is gorgeous! So, I went and raked them up on Sunday so the kids could have a little fall fun. Meg is getting over being sick and she really needed some fresh air, so even she got to have some fun! It was such a beautiful day outside that the kids got to carve pumpkins outside. Thanks to the Voster's for the pumpkins. The kids had a ball carving them and actually got to decide how they looked (except Ally). They turned out pretty good! Downside is that we may have some pumpkins growing in our lawn next year. HAHA! Happy 60th Birthday Grandma Jean! Sunday marked Grandma Jean's 60th birthday. We hope that her birthday and this upcoming year will bring her good health and fun times!! 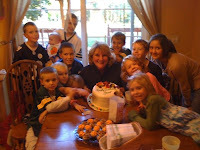 Here is a picture of her at her party with her 11 grandchildren. Gosh I love Jib Jab! So, at Christmas time you can usually do a video thru Jibjab.com of your family as elves. I got quite a kick out of it last year. This year they now have a Halloween one. And of course I couldn't resist it. So, click here and enjoy! Every year we get the kids little pumpkins and let them go crazy with painting them. Today was the painting fiesta at our house. I am not a big fan of the paint supplies being pulled out when Ally is involved. It is like a free for all with her. You never know what's going to get painted. Usually it is not the object that is supposed to be painted. :) So, as you can see she did not have much interest in painting her pumpkin, but enjoyed painting paper, her hands and the chair she was sitting in. This is also why I make them take their shirts off and for Ally everything but the diaper. It is funny because Ally really does not like the finger paints, so every couple minutes she was wanting her hands cleaned. Good times! Jack and Meg on the other hand could paint for hours if I let them. They got every inch of their pumpkin painted. And then moved on to painting paper. They really love it! Yesterday we threw my brother, Jim, a surprise 40th birthday party. We had a great time with all the family and friends that were able to make it. And I think Jim enjoyed himself a great deal. Checkout the slideshow on the right to see the pics from the party. Thanks to everyone out there that sent me in stories and pictures about Jim. The book turned out beautifully! I can't believe it is already the middle of September. Up here in WI we are starting to get fall weather. Cooler day today. This is my favorite season of the year. I love the trees changing color and getting out the sweatshirts and sweaters to wear for those brisk nights. I love it! So, what is new in the Pontow house?? Well the kids are back in school now. YIPEE! They are at the grade school in our neighborhood this year. It reminds me so much of my grade school that was so close to home and the kids are able to ride their bikes to school. So, we have been doing that every day and will keep doing it until the weather is unbearable. HA! Just can't think of driving when the weather is nice. Ally so wishes she was going to school. Every day on our bike ride home she asks the same question "Where's Jack and Meggan?". I tell her the same thing everyday. They are at school and some day soon you will be there too!! Next year we will definitely be looking at a 3 year old preschool for her. The nice part is that when we get home she goes right to bed and there is no fight over taking a nap as their used to be when Jack and Meg were home. The kids are really loving it! So many of the neighborhood kids are at this school and they all are so sweet and friendly. It is really good for Jack and Meggan! So, school is just in the afternoons for them, but then next year they will be in ALL DAY!! YAHOO! Next year's kindergarten class is offering it all day. So, we are excited about that. We did also get to go on a family vacation. We drove out east and stayed with Aunt Denny for almost a week. It was a WONDERFUL time! The biggest thing that the kids talk about is that we got to go on a tour of the White House thanks to Jim's connections and catching crabs and Patty and Chuck's house. They could not believe that they were in Obama's house. It was quite fun to see their faces thru it all. Of course the kids were a bit wild and emotional from the long days, but we made it thru it! The drive was not so bad. We drove thru the night so that the kids would sleep for most of the trip. Then on the way back we stopped in Chicago for 4 days to hang with the folks. We look forward to going on another adventure next summer when we finally get to go to DISNEY WORLD!!!! We also got together with all of Meggan's friends and had a reunion of sorts. It was so great to see all of them and now grown up! Boy do I sound old!! They all have such amazing kids and spouses!! A great time was had by all! All in all, it has been a crazy summer. We also fit in quite a few camping trips and still have 2 more trips to take before Halloween rolls around. And the fall/winter will not be any quieter with the upcoming nuptials of my cousin Mike and Stef. Ally and I are in the wedding party and so looking forward to their special day! So, this will keep us busy until Christmas. But it is a nice busy! One that I would not pass up for the world and one that I am honored to be a part of! Well until next time! Take care and hope all is well with everyone! Today marks my brother Jim's 40th birthday! Happy Birthday Jim!! !We hope you are having an awesome time in China and are really taking it all in. :) We love you and are so lucky to have you in our lives!! You are truly an amazing human being! KISSES!!! WE'RE GLAD YOU WERE BORN!!!! Today is my niece, Molly's, birthday! We talked to her tonight and she sounded like she was having a wonderful day! 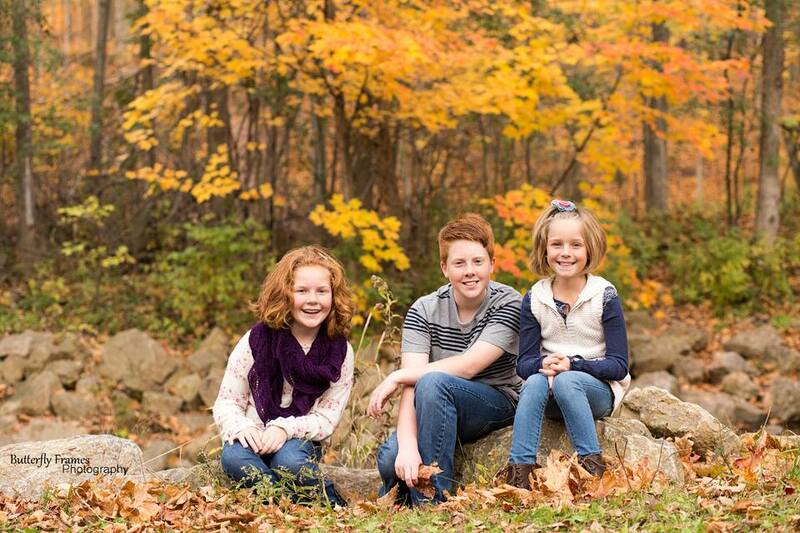 We love you so much Molly and are really glad you were born! You are sweetheart and deserve to be treated like a princess!! Have a wonderful birthday!! This past weekend we took our 3rd camping trip of the year to Potawatomi State Park in Sturgeon Bay, WI. It is hard to believe that we are already half way thru the summer. It feels like it has only just begun and with the strange weather we have been having it has definitely been an odd summer. This state park was a really really nice park. Clean showers and bathrooms (that is the non-pit toilets) always make me a happy camper. There were a lot of great spots to hit being that we were in Door County. Lots of great memories of being in Door County when I was pregnant with Jack and then again when I was pregnant with Ally. It is a beautiful place that I had never ventured to until 5 years ago. If you haven't been you must go! Great beaches and hiking trails that had pretty views! The kids had a ball taking leaves and making shading pictures with them. They also made "cookies" out of playdoh while we got dinner ready. Lots of smores were had and our friends, The DeValks, introduced us to a yummy new campfire treat of melted caramel on a Ritz cracker. YUM YUM! Happy Birthday to our nephew Jimmy!! We hope you have a wonderful birthday and an even better year!! We love you very much! We got to climb up a tower so we could overlook the pretty view of Lake Winnebago. That was a lot of fun to climb. Ally was quite the trooper with her short legs walking up all the stairs on her own. Because she would have it no other way. :) We also went on a nice bike ride around the Butterfly pond. We heard a lot of birds on that bike ride that had Ally ever so interested in them. After the bike ride Chad and the kids went for a walk and checked things out. They also got to play at some parks which always makes for a good time. We had a picnic lunch down by the lake which was fun for everyone. We also had a nice visit by some Raccoons which made for an interesting night on Friday. Oh boy were they loud! All in all, it was a good time, but we sure did miss Meggan as you can see from this pic below! We are so excited for Chad's sister, Crista and her husband Chad to finally have a baby in their hands. They are in the process of adopting, Elias Michael. It has been a long anticipated wait for them to have a child and as you can see from this picture they are complete naturals. They are so thrilled as are all of the Pontow and Backes families. We took the kids to meet Eli last night when he was only 6 days old. It was so neat to see them interacting with Eli. Jack just sat there holding him and was singing "Twinkle Twinkle Little Star" to him. Just as he and Meggan did when Ally was a baby. Then there was Meggan. She could not stop smiling as she held Eli. She doesn't really remember holding Ally as a baby even though she did, so she felt like it was her 1st time. She kept saying she thought that Eli was hungry. I think she really wanted to feed him, but I got to do that. :) He just laid there sleeping not stirring at all. Nice snugly little guy. She was looking at his belly button and his face a lot. Meg did not want to give him up when it was everyone else's turn that is for sure! We did not think we would let Ally hold Eli because she is too much of a wiggle worm and we did not know how she would be. She kept saying Baby Baby Baby over and over again. And she would not move away from him. She kept wanting to hold him, so we finally gave in with me sitting literally right next to her so there could be no quick moves. :) Her arms were actually under the Boppy pillow that he laid on which was perfect because she could not touch him. She sang a little to him and was very interested in his fingers and toes. Which are SOOOOO long! Welcome to the family Eli!!! Finally Jack has begun T-Ball. He has been dying to be on a baseball field and play ball. So, we are glad the time has arrived. And he is lucky enough to get to be on the same team has his cousin Hayden. So, that is fun for them. Right now they don't play a specific position they are kind of all over the place. But, what is funny about Jack is that no matter where that ball goes he is running all over the field to get it. HA! And he understands that when you get the ball you should try to throw it to 1st base. Yesterday marked my mom's birthday. We made a special trip down on Saturday to surprise her and make it a wonderful day for her! She was surprised when she came home from a wedding to find us hanging out at her house. She deserves the best! She is an amazing mom, friend, nama, sister, wife and aunt! In addition, to it being her birthday it marked the end of her working days. On Friday, she retired from work. YEAH!! She can now spend ALL of her time with my dad. tee hee! They will get to travel more and do things she has been wanting to do for a long time. So, it is great that she finally after so many years for working can relax and just enjoy life! Sweet Meggan has turned 4. And it has been quite a couple days of parties and gifts for her. On Sunday we had a party with Chad's family and Nama and Papa, as well as, our surprise visitor.... UNCLE JIM!!!!!!! YEAHH!!! That was quite exciting for the kids. The kids have missed him a great deal, so it was great to get to see him and now they will get to see him again this next weekend when we are down closing out the birthday season for the Pontow kids with a party with my family. So, sad to see the birthday season end for them. Anyway, Meg got a lot of great gifts. Some VERY cool Crayola window crayons from our neighbor Elle, clothes for her bitty baby from our neighbor John, clothes from all of the family, a PINK Razor scooter, lots of art supplies for her projects (watch your mailboxes!!!) and a very cool beauty table that talks to her and has a mirror for her to do her hair and makeup. So cute! Jack and Ally have thoroughly enjoyed that as well! What's Jen reading right now?